Animals play a key role in veterinary education and the advancement of medical care, and Auburn University’s College of Veterinary Medicine strives to ensure that it follows only the highest standards in the care of animals under its charge. To validate that obligation, the college recently underwent a rigorous evaluation, attaining full accreditation by the Association for the Assessment and Accreditation of Laboratory Animal Care, International, or AAALAC, a distinction that the college has maintained continuously since 2003. All vertebrate and some invertebrate animal species fall under auspices of AAALAC accreditation, according to Dr. Rynders. Attaining accreditation and maintaining it is a journey of continuous improvement. The evaluation is conducted by a multi-person team of animal welfare and care professionals from various organizations and institutions operating on behalf of AAALAC, Dr. Rynders said. Its visit follows a period of self-assessment by the institution seeking accreditation; participation is voluntary. The AAALAC accreditation team made its site visit to the college in February. The college was notified recently that it would be re-accredited. AAALAC International is a private, nonprofit organization that promotes the humane treatment of animals in science through voluntary accreditation and assessment programs. Having the accreditation and the acknowledgement of an organization such as AAALAC attests that the accredited organization follows ethical and humane practices in its animal education and research undertakings, above those mandated by law. More than 1,000 companies, universities, hospitals, government agencies and other research institutions in 47 countries have earned AAALAC accreditation. Some of the institutions that have earned AAALAC accreditation include the Sloan-Kettering Cancer Center, St. Jude Children's Research Hospital, The American Red Cross and the National Institutes of Health. 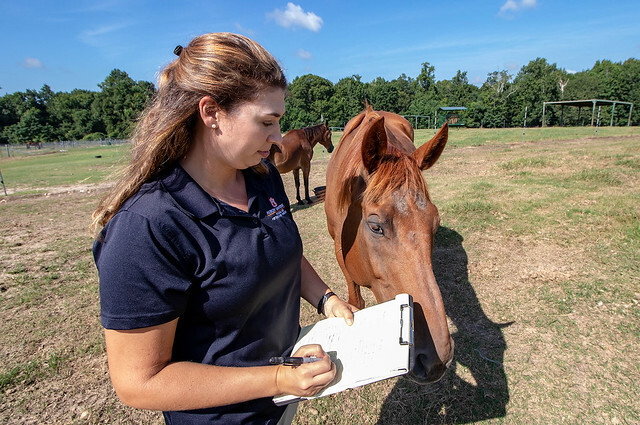 Jessica Brown, coordinator of large animal research at Auburn’s College of Veterinary Medicine, assesses one of the college’s horses.